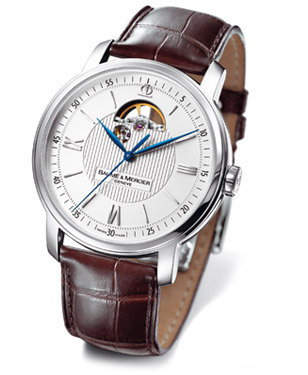 Andy Garcia wears a Baume & Mercier Classima Executives watch in this advisual. For the 2010 Baume & Mercier & Me charity campaign, Andy Garcia wears a Baume & Mercier Classima Executives XL MOAO 8688 steel watch. This classic, elegant watch as Roman numerals, blued hands and its guilloché dial features an opening that reveals the balance. 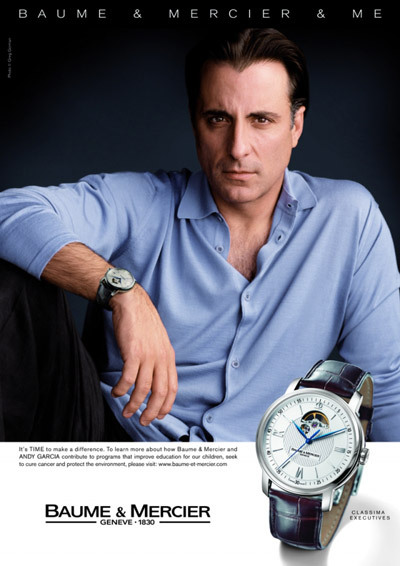 The philanthropic mechanism of the Baume & Mercier & Me campaign is both simple and effective: Andy Garcia, like the Hollywood celebrities in the previous campaigns, is offering voluntary use of his reputation and his image by serving as a Baume & Mercier ambassador for a full year – in exchange for the brand providing financial support to the charities of his choice. All royalties normally due to Andy Garcia, as well as those of photographer Greg Gorman, will be donated to several organizations working in the fields of cancer research, child education, helping underprivileged women and the struggle against poverty.